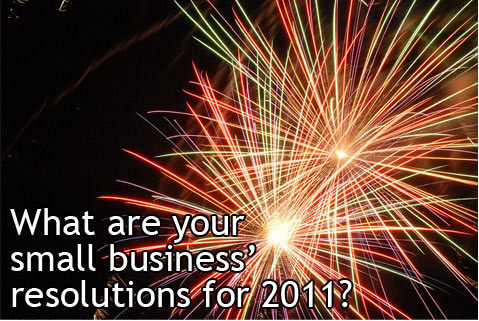 What Are Your Small Business� Resolutions for�2011? The past year was a busy and exciting time for small businesses. Changes in marketing, finance and health coverage presented a unique set of opportunities and challenges to companies and owners in 2010. Congress approved hiring and healthcare tax incentives, while tech firms and startups introduced new marketing strategies such as mobile apps, group buying platforms and location-based social networks. However, 2010 is done and gone, and now is the time for small business owners to begin planning and preparing for what 2011 may have in store. While many of these trends (especially social media technologies) will continue to grow and influence companies� bottom lines, others will pop up unexpectedly, leaving owners to wish their crystal balls weren�t so cloudy. Luckily, there are a number of resources available to help entrepreneurs and businesses set realistic goals and stick to them. Not only will it be important for owners to make sure they keep a keen eye out for future trends, but they will also need to evaluate basic business practices, such as financial and marketing strategies, that require updates. Contributed by Amsterdam Printing - providing thousands of promotional products, including personalized pens, calendars, apparel, and mugs for SMB and organizations.